Now in its 5th edition, this trusted resource written by experienced and respected childcare author Tina Bruce has been updated to include the most recent theories and research, including new studies on language acquisition, attachment theory and self-regulation. 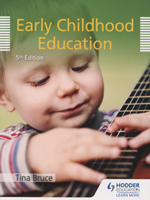 Early Childhood Education 5th Edition is the perfect textbook for a wide range of Early Years and Childcare qualifications including BA Hons in Early Years Education and Early Childhood Studies, PGCEs and Foundation Degrees. - Gives a detailed overview of education principles in early childhood, all outlined in Tina Bruce's clear writing style. - Uses case studies to help learners understand how theories apply in real-world settings. - Supported by highly illustrative photographs showing the key aspects of practice.